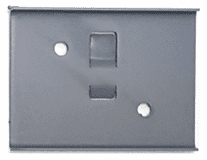 Replace those worn, cracked or missing hood inserts with these brand new reproductions. Built to factory specs, they add the perfect touch when completing your restoration. Die cut from original style and thickness of black plastic. Prevents chipping of hood paint when hood inserts are installed. Fits under chrome performance hood inserts found on Swingers and GTS Darts. Die cut from original style and thickness of black plastic. Prevents chipping of hood paint when hood inserts are installed. Fits under chrome Power Bulge hood inserts found on Super Bee and R/T. Die cut from original style and thickness of composite gasket material. Prevents chipping of hood paint when hood inserts are installed after painting separately. 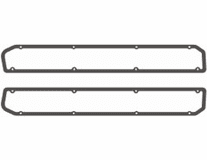 Can also be used on 1968 cars that originally used a formed plastic gasket. 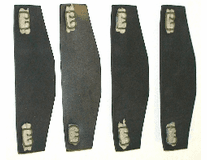 Set of four die cut rubber seals with correct sealing wire clips. Two used on each side of the Air Grabber/Ramcharger plenum to allow water (as well as small birds, bugs, and Chevy parts!) to exit, while keeping the hot engine compartment air out. Set of two die cut rubber seals with correct sealing wire clips. One used on each side of the Air Grabber/Ramcharger plenum to allow water (as well as small birds, bugs, and Chevy parts!) to exit, while keeping the hot engine compartment air out. 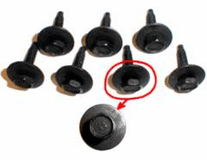 Seven correct "anchor" head 10-24 screws for mounting shaker bubble to steel base plate. This quality reproduction kit is used on 1969 Road Runner and GTX WITH Air Grabber and includes six long and ten short retaining clips formed from the correct gauge steel then zinc phosphate & oiled to resist corrosion. Includes four screen retaining angles that are powder coated red to match the Air Grabber screen. 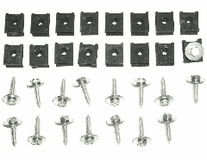 Kit also includes 16 8/32 x 5/16” long PHP zinc plated machine screws. 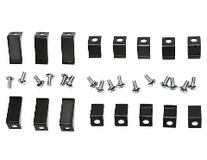 This quality reproduction kit is used on 1969 Road Runner and GTX WITHOUT Air Grabber and includes six long and ten short retaining clips formed from the correct gauge steel then zinc phosphate & oiled to resist corrosion. 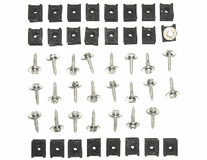 Kit includes 16 8/32 x 5/16” long PHP zinc plated machine screws. 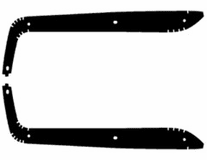 A quality reproduction hood bumper reinforcement plate used on 1969 Plymouth B-Body and all 1970 B-Body vehicles. Formed from the correct gauge material and heat treated to provide the proper temper and wear resistance of original parts. Epoxy coated and ready for installation and paint. Often missing or damaged, and these don’t come with a reproduction hood! 1970 Coronet uses 3 pieces, two for the bumpers and one for the hood latch spring. Reference part number 2949 273. 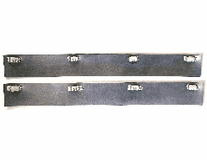 A quality reproduction hood bumper reinforcement plate used on 1971 B-Body and 1972-74 A, B, & E-Body vehicles. Formed from the correct gauge material and heat treated to provide the proper temper and wear resistance of original parts. Epoxy coated and ready for installation and paint. Often missing or damaged, and these don’t come with a reproduction hood! 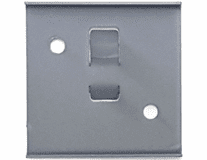 Reference part number 3579 671. Correct zinc plated #10 hex coni sems screws with “AF” head markings and zinc phosphated U-nuts for mounting the Air Grabber hood seal to the fiberglass plenum. 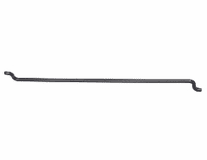 Used on 1970-72 Plymouth and 1971 Dodge Air Grabber hoods. 16 sets of screws and U-nuts included. 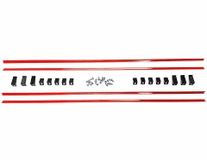 Correct zinc plated #10 hex coni sems screws with “AF” head markings and zinc phosphated U-nuts for mounting the Air Grabber or Ramcharger hood seal to the fiberglass plenum, and 8 sets are used to fasten the air box to the hood. 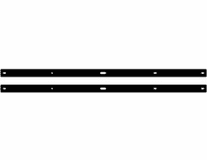 Used on 1969 Plymouth Air Grabber and 1969 Dodge Ramcharger hoods. 24 sets of screws and U-nuts included. Correct zinc plated #10 hex coni sems screws with “AF” head markings and zinc phosphated U-nuts for mounting the Ramcharger hood seal to the fiberglass plenum, and 18 sets are used to fasten the air box to the hood. Used only on 1970 Dodge Ramcharger hoods. 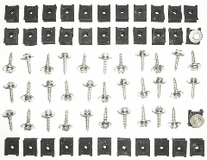 34 sets of screws and U-nuts included.